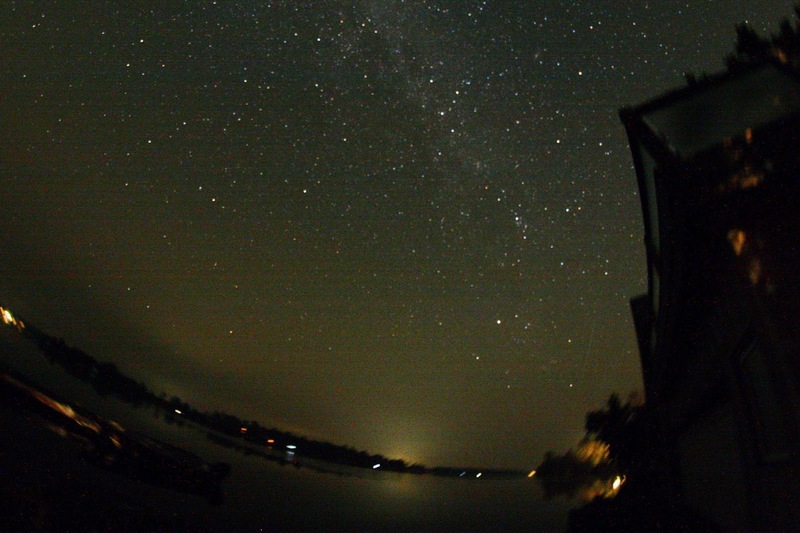 Tried some long exposures with the barn door tracker from beside the boat house while Rhonda took in the whole sky from the dock. Hadn't used my custom BDT for a while. Centred on Camelopardalis. Canon 40D, Rokinon 8mm, f/5.6, manually focused, ISO 1000, intervalometer, 4 minutes, daylight white balance, RAW, tracker, tripod, DPP, GIMP. Double Cluster is visible. Near the top-right, the Andromeda Galaxy. Cepheus with δ (delta) Cep near maximum.